I hate oats but somehow I have them in my pantry all the time.So this time,I decided to turn them into something different.The granola bar is a good option but I also found a savoury one with J&B. 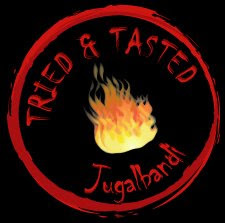 I followed the Jugalbandi recipe(Click here for the original) with little changes and ended up eating the most of it.Here's the recipe. Mix all the ingredients except fruit bites in a bowl and spread as a layer in a greased baking sheet.Bake on a pre-heated oven for 25 minutes at 300F,stirring every 10 minutes so the mix browns evenly.Take out and when cooled garnish with dried fruit bites or fruits of your choice. I avoided the coconut in the original recipe and also used maple syrup instead of pomegranate molasses.You can even add cashews,almonds or figs or little dried fruit bites to the mix while baking.I used more chilli powder than syrup but this can be adjusted as per your taste. Serve as a snack or in a trifle or parfait with yoghurt and fruits. (I did not nothing simply ate them as such). The sweet and spicy taste makes oats more palatable.So this granola travels to spice up Zlamushka's Kitchen for the Tried and Tasted event where Jugalbandi is the featured blog. Wow something yum to try out. I tagged u with beautiful poem on friendship. an award is waiting for u in my blog! Looks very crunchy and delicious.. Thank you so much for aprticipating, this granola looks fantastic. glad you liked it, dear sweatha.